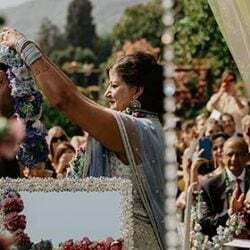 As floral designer one of the most important moments during a wedding planning is the decision to take for floral arrangements and colors to use. 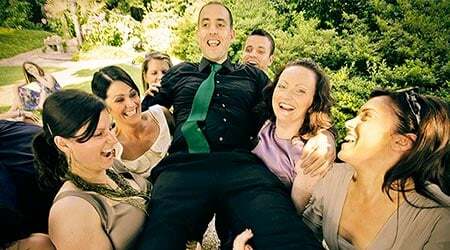 During first contacts I always try to understand bride and groom’s tastes and needs to suggest the best solution for them. Sometimes they have very clear ideas in their minds. 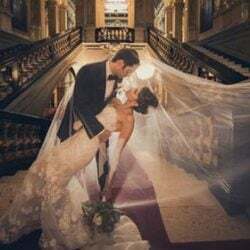 Basing on this and on my experience and creativity i try to develop a floral arrangement project that will be just perfect the day of the wedding. 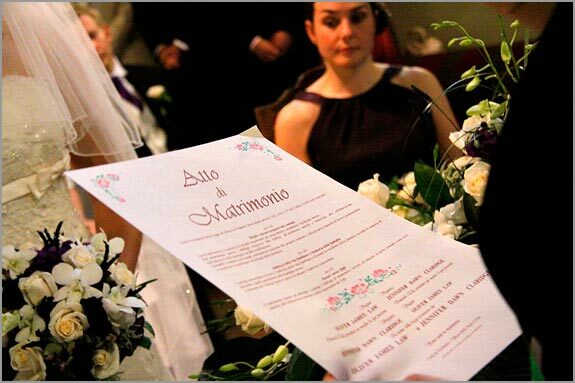 This is what happened with Jennifer and Oliver a British couple whose wedding was planned for September 2009. One year before Jennifer told me about the floral scheme she had in her mind. All was based on purple matching with ivory. 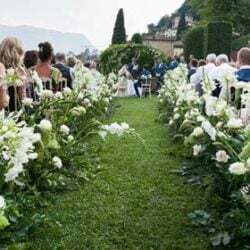 The very good hint arrived in following emails when Jennifer mentioned about the idea of adding Mediterranean aromatic herbs among flowers. I was delighted with the design and colours they were truly beautiful. One of my many memories from our special day is the scent of the mint and rosemary in the flowers. I kept getting scents of the mint throughout the day and it is something that will always remind me of my wedding day. 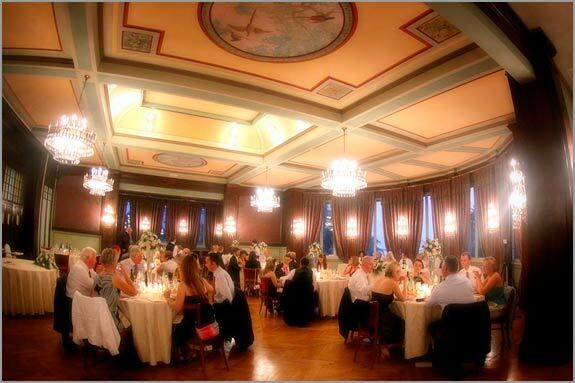 All the guests commented on the amazing table displays – it was better than how I’d imagined – romantic and elegant with the candles and petals. I even managed to fly home with my bouquet and we are drying it out to keep as a memento of the day! Thank you once again for your fantastic work – the flowers were truly beautiful. 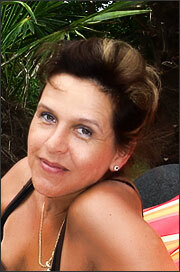 This was planned to recall Italian style and the wonderful scents she loved in her childhood. 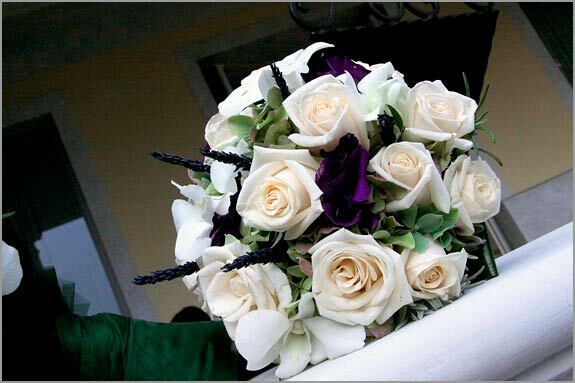 Just a little great idea that gave me the occasion to work on a floral arrangement based on purple and ivory with fresh and perfumed Mediterranean herbs such as rosemary, sage, mint and lavender. 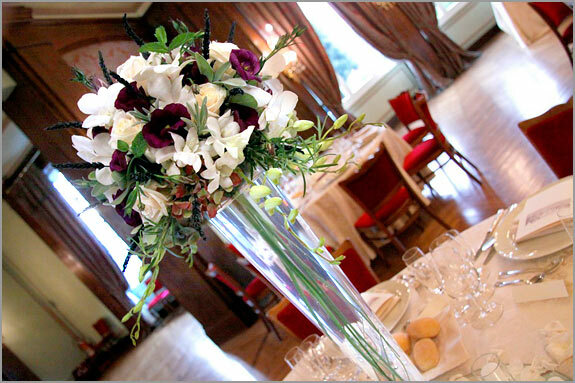 They could be a perfect green base to create the bouquet on but also centerpieces and ceremony decorations. Aromatic herbs offer an evocative range of colors from green to silverish of sage and lavender up to deep green of peppermint. Last but not least little lilac-blue lavender blooms could be the trait-d’union between purple and ivory flowers of the compositions. This was my proposal for Jennifer and Oliver’s’ wedding floral arrangement. Jennifer feed back came back very quick. She was really excited for that: she loved all details of my proposal, she was literally looking forward to see and smell the flowers on her wedding day. We started a planning that lasted few months and leaded to final result that you can see in this post. Everybody and especially bride and groom loved the floral arrangements. 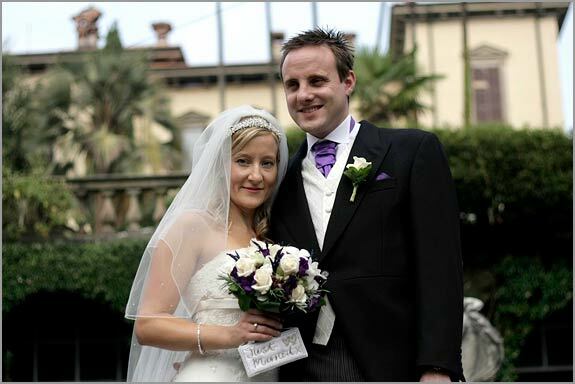 Jennifer and Oliver after their honeymoon sent also a lovely email to thank us for all. You can read a piece of that here. 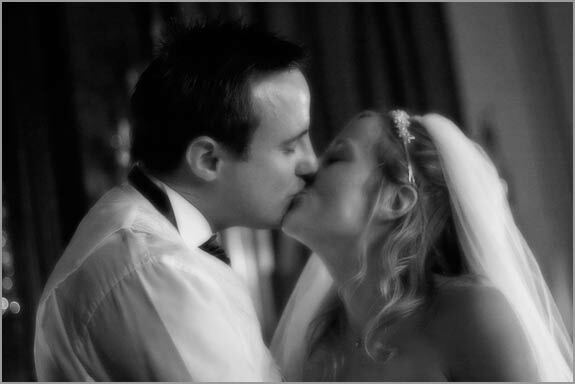 But I also want to tell you something more about Jennifer and Oliver’s wedding! 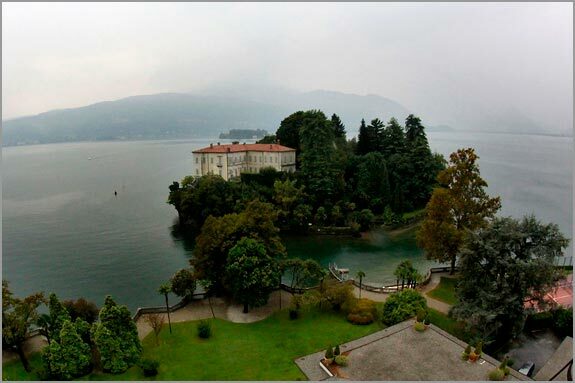 They arranged all in Pallanza on Lake Maggiore. 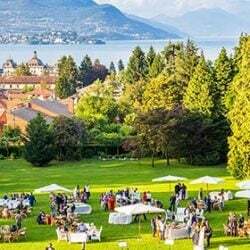 Ceremony was held in Villa San Remigio while reception was arranged to Grand Hotel Majestic where almost all guests spend their Italian days. 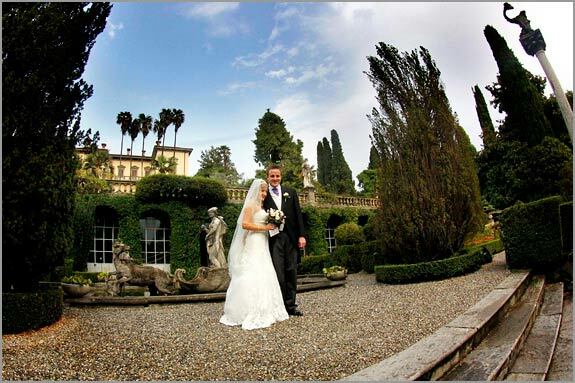 Wedding coordinator was Valentina Lombardi who is part of Italian Lakes Wedding Team. 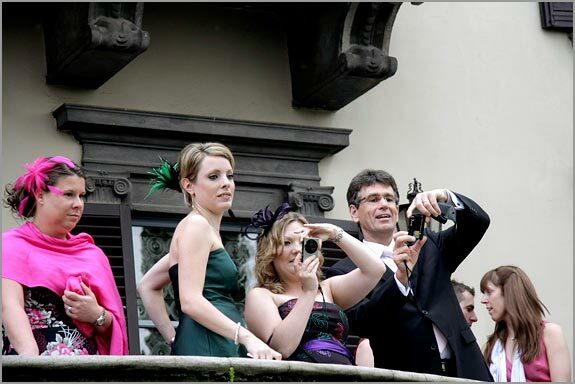 Photographs were taken from Photo27 from Milan that I thank you for giving us the beautiful images you can see here. 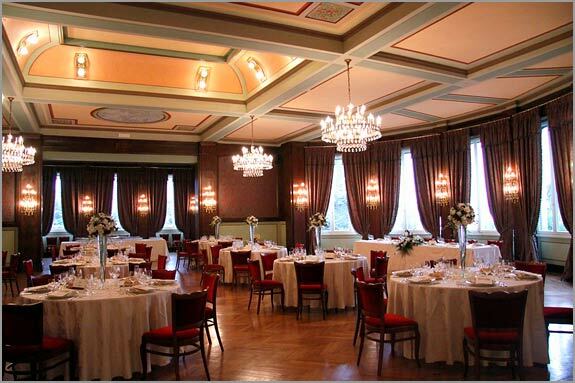 The civil ceremony has been celebrated in wonderful Music Room (Sala della Musica) of Villa San Remigio. String quartet classical music created a wonderful romantic atmosphere. Big Jennifer and Oliver’s day begun with a cloudy day but after few hours sun decided to come back again turing into a wonderful summer end day! Villa San Remigio wide park and its secular tress, fountains and statues are the perfect settings for wonderful wedding pictures. Have a look to the natural style and great impact of the picture here below, simple but wonderful! At the end of the ceremony Jennifer hanged on her bouquet a funny “Just Married” sign with two hearts, what a funny idea! Bridal dress was wonderful rich of pearls, and delicate laces. Have a look to groom’s suit too! 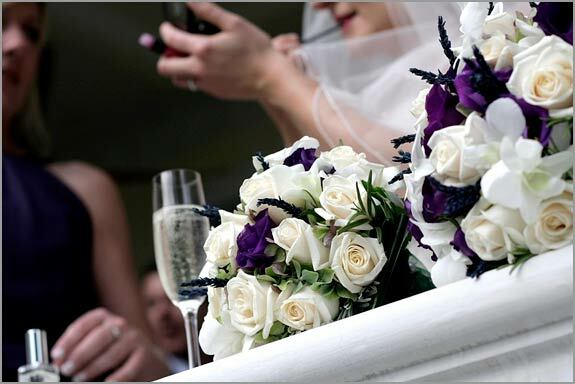 It perfectly matched wedding color theme with is tie and purple details. 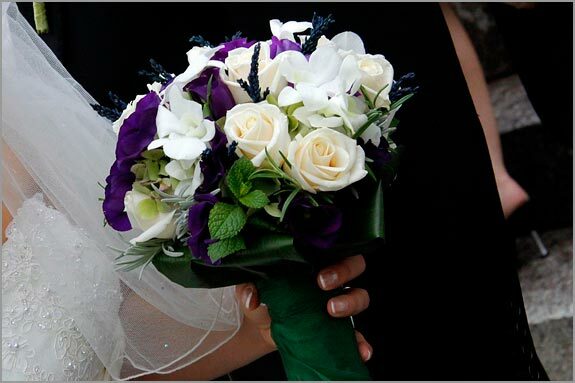 In bridal bouquet, side of scented herbs, I added Vendela roses, dendrobium orchids, lavender blooms, purple Lisyanthus on a base of apple green hydrangeas. 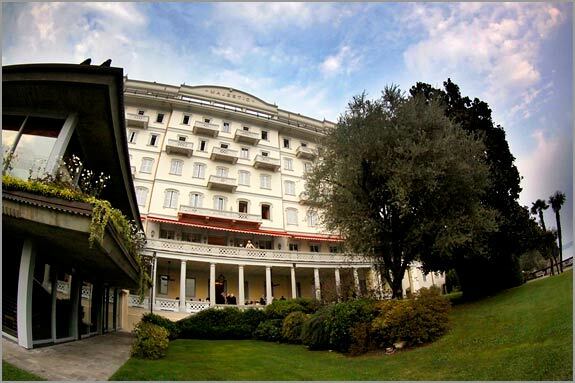 After wedding pictures bride and groom with their guests went to Grand Hotel Majestic just few minutes drive from Villa San Remigio. 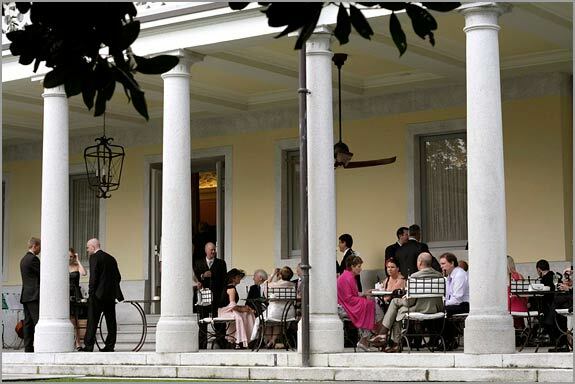 Wedding party begun with a nice aperitif under the columns porch overlooking the garden and Lake Maggiore. The picture you can see below taken during the aperitif is one of my favorite of Photo27 service. Please take a look to the spontaneous and deepness of the shot. 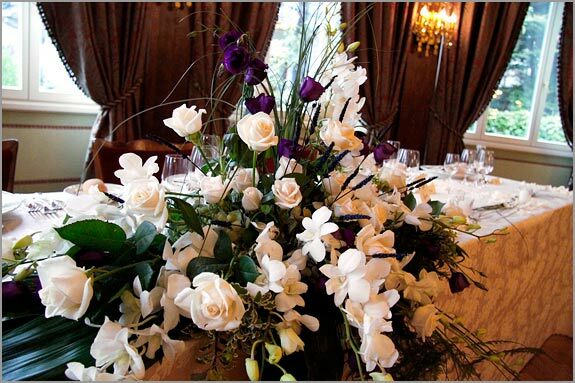 As floral designer most challenging task was the creation of centerpieces to decorate the elegant Grand Hotel Majestic Toscanini Room. A two days long preparation. In the center of each table I placed a big round mirror with tall vases on. On top of them I put my floral decoration that matched bouquet style. In this case I mostly used Dendrobium orchids to get a falling and light effect. On the top table I placed a big composition made of Aspidistra leaves and Bear Grass that made it even bigger. The details all these arrangements had in common were the great use of aromatic herbs: mint’s deep scent together with rosemary, lavender and sage gave to Toscanini Room a real mediterranean atmosphere. A wonderful scent that will stay in everybody memory for long time as Jennifer wrote in wonderful and kind email. 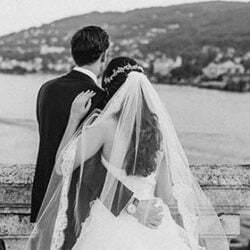 A little memory of their dream wedding on Lake Maggiore that that Jennifer and Oliver will keep in their heats for forever. 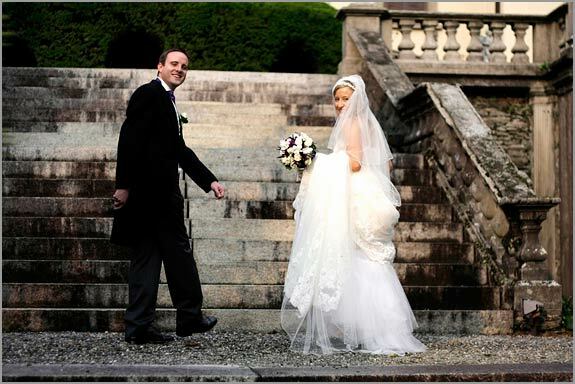 For more information about weddings on Lake Maggiore please contact us.